Take 2 servings (2 scoops) with 8 to 12 oz. of water and consume 30 to 45 minutes before your workout. Stimulant sensitive individuals should assess their tolerance before using. Do not exceed 2 scoops in a 24-hour period. Drink 10 glasses of water daily for general good health. Read the entire label before use and follow directions provided. Not intended for use by persons under 18. Do not use if pregnant or nursing. Discontinue use and consult a medical doctor if you experience unusual symptoms. Consult a medical doctor before use if you have been treated for, or diagnosed with, or have a family history of any medical condition, or if you are using any prescription or over-the-counter drug(s), including blood thinners. One serving of this product contains up to as much caffeine as 2 cups of coffee. Caffeine sensitive individuals may experience the following symptoms, including (but not limited to) restlessness, nervousness, tremors, headache, anxiety, palpitations, increased heart rate, or difficulty sleeping. Consult a medical doctor before starting any diet or exercise program. Do not exceed recommended serving. Improper use of this product will not improve results and is not advised. Use only as directed. KEEP OUT OF REACH OF CHILDREN. Natural And Artificial Flavors, Citric Acid, Acesulfame Potassium, Calcium Silicate, Sucralose, FD&C Red No. 40. Natural And Artificial Flavors, Citric Acid, Acesulfame Potassium, Calcium Silicate, Sucralose, Red Beet Powder (Color). Jun 17, 2015 PEAK ATP – Extracellular Muscle Building! 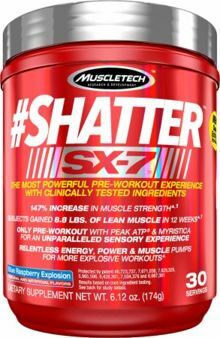 New #SHATTER SX-7 is a creatine-free pre-workout formulated with super-extreme and cutting-edge, premium ingredients that delivers a powerful and unparalleled workout experience. It is unlike anything you’ve ever tried! The unique, clean formula was designed to help you shatter your personal records and workout plateaus. A nutmeg (seed) that contains a powerful premium compound called myristicin, which contributes to the unique sensory experience. An adaptogenic herb that contains ociglycoside I, rosmarinic acid, and triterpene acids such as oleanoic and ursolic acid. A premium brown algae that contains unique polyphenols called phlorotannins. #SHATTER SX-7 contains a 1,200mg dose of beta-alanine to help boost your muscle carnosine levels. Contains the pungent compound G-paradol. #SHATTER SX-7 provides a potent dose of stimulant caffeine for increased focus, endurance, and energizing effects. Hard-training subjects who supplemented with Peak ATP in a 12-week human clinical study at the University of Tampa increased strength by 147% more than subjects using a placebo. Even better, these same subjects gained 8.8lbs. of lean muscle vs. the placebo group, who only gained 4.6lbs. – that’s 90% more lean muscle. The Peak ATPcompound also forces crazy muscle pumps unlike anything you’ve ever felt. Contains 7 cutting-edge ingredients to deliver a powerful pre-workout experience. One of the most powerful clinically studied ingredients in #SHATTER SX-7 is Peak ATP. Hard-training subjects who supplemented with Peak ATP in a 12-week human clinical study at the University of Tampa increased strength by 147% more than subjects using a placebo on their combined maximum weight lifted on the bench press, deadlift, and squat. Even better, these same subjects gained 8.8lbs. of lean muscle vs. the placebo group, who only gained 4.6lbs. – that’s 90% more lean muscle. When is the last time your pre-workout delivered those kind of gains? Hard-training subjects who supplemented with the precise dose of Peak ATP contained in #SHATTER SX-7 over a 12-week clinical study at the University of Tampa gained 8.8lbs. of lean muscle vs. the placebo group, who only gained 4.6lbs. – that’s 90% more lean muscle. Hard-training subjects in the same study increased strength by 147% more than the placebo group on their max bench press. By increasing plasma ATP levels in the blood, the ATP compound binds to vascular endothelial receptors, resulting in nitric oxide production to induce extreme vasodilation. This increases oxygen and nutrient delivery to the muscle, which causes the best muscle pumps you will ever experience.